Common in the Cascades and coastal mountains from Alaska to northwest Oregon. Occurs from low to subalpine elevations. Often in moister sites. 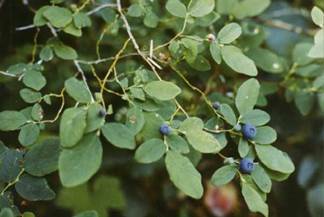 Often one of the dominant shrubs in Alaskan and BC coastal forests, often growing together with Vaccinium ovalifolium. Moist coniferous forests and forest openings. Vaccinium alaskaense can tolerate shade and can be found in late successional undisturbed forests. Thuja plicata, Tsuga heterophylla, Tsuga mertensiana, Abies amabilis, Xanthocyparis nootkatensis, Polystichum munitum, Vaccinium ovalifolium, Ledum glandulosum, Oxalis oregano, Oplolanax horridus. Berries ripen in mid to late summer. Shelf life of up to 12 years. In good conditions annual growth can be up to 10 inches per year, lifespan not found. 2. Hitchcock, C. Leo; Cronquist, Arthur. Flora of the Pacific Northwest: An Illustrated Manual. University of Washington Press. 1987. 3. MacKinnon, Andy; Pojar, Jim. Plants of the Pacific Northwest Coast:Washington, Oregon, British Columbia and Alaska. Lone Pine Publishing. 1994.